EcoSchool launched its education platform a few days ago. Hopefully it will bring to an end the questions and speculations that we’ve had to deal with at Mazwi, a start up that I have been a part of since 2013. What does the EcoSchool launch mean for our startup in particular and the digital education ecosystem in general? Are we secretly a part of it? If not, is this launch the end of our days? When will we quit and what where we thinking in the first place? I guess these are the kind of glum questions that one has to contend with when you suddenly wake up smack in the path of Econet. For most startups and corporations, it is the stuff of nightmares. We have, however, always seen ourselves as something much more malleable, subject to what EcoSchool or any other MNO does. We are a startup after all and Econet is a multinational corporation. That fact alone separates us completely. Putting the supposed gloom and doom aside here are 4 reasons why Econet’s EcoSchool could be a good thing for the ecosystem as a whole. There is certainly a lot I don’t know fully about EcoSchool that I would love to know, but the biggest and most important thing that I do know is that EcoSchool will make devices more accessible to more people. Students in particular. The significance of this milestone is much more far reaching than many people will realise. At $6 a month for 24 months to acquire the 7” EcoSchool Android device, EcoSchool has come the closest to making digital devices accessible to every student. These tablets will officially (in my books) be the “easiest” devices to buy and some of the the cheapest that exist in the market today. This is important, this is very important. Digitising content and making it more affordable for a student – while challenging – is the easier thing to do if you are to compare it to making sure that each student and her classmates have the devices to access that content. For this reason, most e-learning programs have intentionally discriminated against the poor members of society who stand to benefit the most from digital education. These devices now form the cornerstone of what could go down in history as the first single most deliberate effort to democratise and expand the scope education in Zimbabwe and hopefully Africa. Time will tell I guess. Today our schools are dealing with a lot of challenges and a turbulent policy environment as government grapples with some of the more important and critical challenges in the education sector, like extra lessons (really?). Higher education is no exception. Zimbabwean universities, like primary and secondary schools have remained largely stagnant over that last few decades. You will be mistaken to assume that this stagnation in the education sector is an opportunity for innovation and progress. Unfortunately, with that stagnation has come layers of bureaucracy, mistrust and corruption. Many startups I know of that have tried to venture into mainstream education with a digital solution of one kind or the other have run out of money during the endless engagement stage with various policy makers and departments. There appears to be a general lack of appreciation and a deep-seated confusion and mistrust of what technology in the classroom means. As Econet enters the fold it will more than likely use its influence and brute force, where necessary, to push digital devices into Zimbabwe’s classrooms. In the process, they will soften the government’s stance on these issues. We will likely see in education over the next decade, the same thing that we saw in mobile money. Rapid growth and adoption that will outpace and ultimately shape government policy. With the launch of EcoSchool for universities, Econet may have ultimately carved out and refined a market segment in the local e-commerce sector that has always been elusive. One of the biggest frustration for most e-commerce proprietors since the advent of local online payments has been identifying and accessing a lucrative yet distinct market segment. It can be argued that most of the potential online activity is in the 18-25 age group. A significant part of this age group happens to be university students. Yet, for a very long time it has been extremely difficult to find a delivery channel that can target university students exclusively since they are fragmented across different devices, screen sizes, operating systems and hardware devices. As EcoSchool puts standard devices with the same capabilities in the hands of most university students, this will surely create an opportunity for more people to tap into that market. Cellphone & electronics sales, job listings, device tracking/insurance, apps, apparel stores, music stores, accommodation, food delivery, social networks and text-books, the possibilities are endless. While Econet has a very clearly benevolent thrust behind EcoSchool, it is a commercial venture after all and I am sure Econet sees an opportunity for commercial success somehow. And herein lies the greatest opportunity for developers and entrepreneurs. While it is not clear to me at the time of writing this piece what the exact business model behind the service is, there is little doubt that data is a major part of Econet’s strategy. 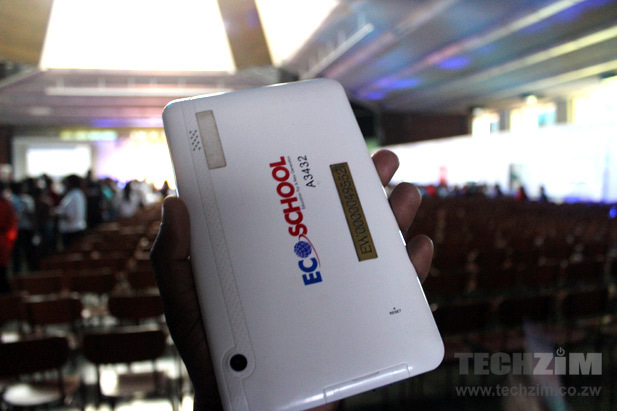 And if data traffic is what Econet is after then it means that it is in its interest for the EcoSchool device to emerge triumphant as the primary device of choice for the student. Essentially, a student must find it better to use their EcoSchool tablet before their ZOL WiFi powered laptop or Telecel powered smartphone. To successfully tread that fine line, EcoSchool must first make sure that the device can carry out all the traditional functions of a tablet device that a student expects for their needs. In addition to that, EcoSchool should ensure that they offer a suite of services and apps that the student and faculty will find useful. It is here that Econet must work with developers and service providers to ensure that a wide variety of local educational services from various service providers and developers converge on the student’s device. If EcoSchool goes this route, it will ultimately create the ideal platform upon which developers and service providers can build their own business models on. What agents have been for EcoCash is what local developers and education service providers may be for EcoSchool. While all this is speculation, it is interesting to see how EcoSchool does, in fact, roll-out their service and what new opportunities or threats emerge as a result. That said, the hope and opportunities EcoSchool has created for our education system through their devices and service are more significant and much more important than the commercial interests or semantics of what will follow. Kudos to EcoSchool. As for Mazwi, we are not shutting down just yet. mazwi needs to allow people to write books and publish them on mazwi and sell them. Any thing that improves the quality and nature of our education is a good development. We must be careful not to tie e-learning system to any provider .Those who enjoy the power that open source brings in technology will be quick to pick up the dangers of tying anything to any network.